Would you hyphenate chill-out? Yes, we think we would. That is all. Thanks, Craigslist. Fit female needed for a electronic chillout Music Video. Looking for a lady 18-30 to float around in outer space in your birthday suit and a helmet. A dark complexion and being able to dance like a robot are a plus. Please attach a body shot and any additional relevant information. Because it is Friday the thirteenth, and because we are choosing to greet this day with optimism instead of paraskevidekatriaphobia, we have decided that this sign — on its face incorrect — is intended to prove the very point it's making. You don't have to be perfect to be lovable. And so we love it, just (as it) is. We tried this optimism thing for the length of one ellipsis, and we can't do it. We just can't. 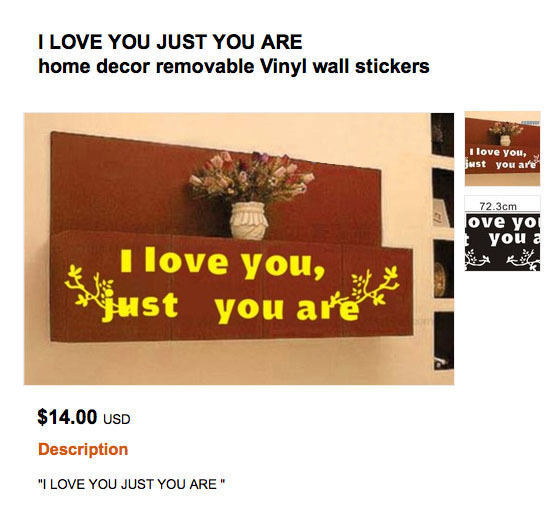 So forget optimism, at least when it comes to vinyl wall decals. Buyer, beware. Also, watch out for black cats. And for the love of all that is right, don't buy wall art that has antlers growing out of the letters. That's mad tacky, people. enjoy the free wi-fi and air conditioning. 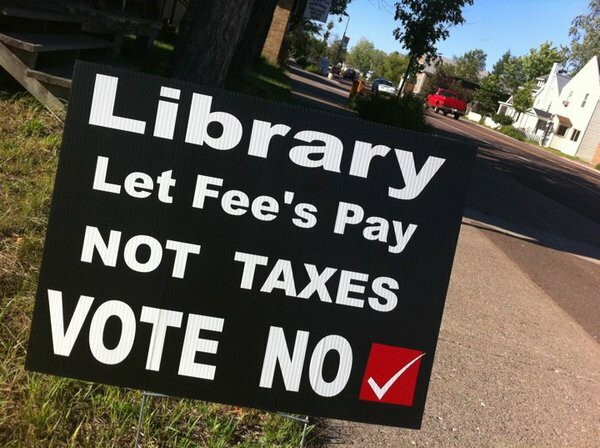 Also, there already is such a thing as a fee-based library. It's called Barnes and Noble (which we also love). We can't help but notice this disturbing trend in cities across the country in which libraries are being shut down, pecked at, and put on the chopping block to balance community budgets. People have no idea how much pleasure they could get and how much money they could save by making the library their first stop in entertainment. Libraries also level the playing field somewhat for the poor. 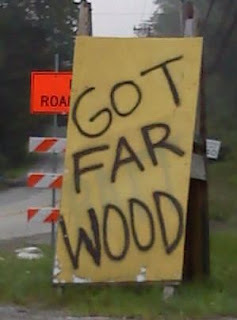 That is why we say to the creator of this sign, "You are a moron. A MORON. Perhaps if you spent more time in your library you would know there is no apostrophe in 'fees'." What's unfortunate and telling is that the person who made this sign lacked the courage to put his or her name and contact information on it. We do understand the cowardice, though. Who's proud to celebrate ignorance? Who wants to stick it to the poor, and to families with young children who can't otherwise afford books? Jerks, that's who. Look, we get that we're in tough economic times. But you don't cut off your feet to save money on shoes. If you have a chance this fall to vote for library funding, please do. And while you're at it, stop by your library to see what you might be missing. Look, we get it. English is not a phonetic language. The spelling is hard. Nonetheless, we recommend burning this sign. Thanks to Matt K. "far" the photo.